With the increasing wine consumption in Asia, there are more wine competitions being held in this part of the world with the aim to help consumers choose wine. The biggest such competition is Asia Wine Trophy, organised by Deutsche Wein Marketing (DWM) and with International Organisation for Vine and Wine (OIV) as patronage. Its third running in 2015 attracted over 3,600 entries from 29 countries, assessed by some 110 judges from all over the world. Its host city is Daejeon in the centre of South Korea, the third biggest city in Korea and where the first Korean wine was made in 1968. The Daejeon city government, keen to promote its wine-based tourism, lends its full support to this competition. 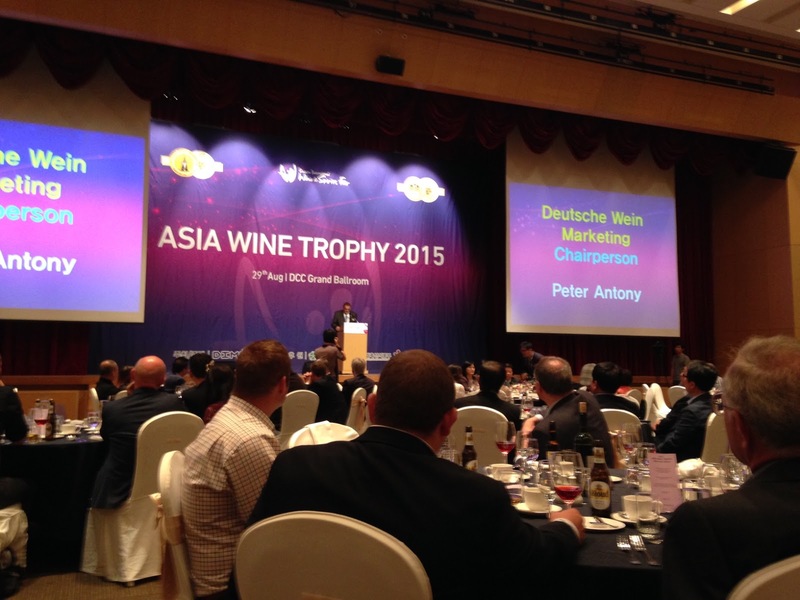 According to Peter Scheib, a steering committee member, DWM is the biggest organiser of wine competitions in the world. Its four Trophies, the biannual Berlin Wine Trophy, the annual Portugal Wine Trophy and the annual Asia Wine Trophy, have a combined 15,000 wine submissions. Judges, who come from different countries, have diversified background from wine producers and importers to educators and journalists, to ensure an unbiased evaluation. All wines are judged according to the OIV international wine competitions’ guidelines on four criteria: appearance, bouquet, taste, and overall harmony. An OIV observer is on site to document and evaluate the tasting process, who may suspend the tasting if the standards are violated. More importantly, judges’ performances are also reviewed at the end of each competition. Only those who pass the review will be invited to judge at subsequent Trophies. Peter also emphasised that only a maximum 30% of wines would be awarded medals, including Grand Gold, Gold and Silver, to maintain the Trophies’ standards and to deliver a pleasant experience to consumers who purchase the winning wines. Judges appreciate the competition as well. Peter Angele, one of the judges and a sommelier from Germany, was delighted to learn about the preferences of his Asian counterparts, while at the same time, happy to share his knowledge and enthusiasm of Silvaner, a German variety seldom seen in Asia, with them. 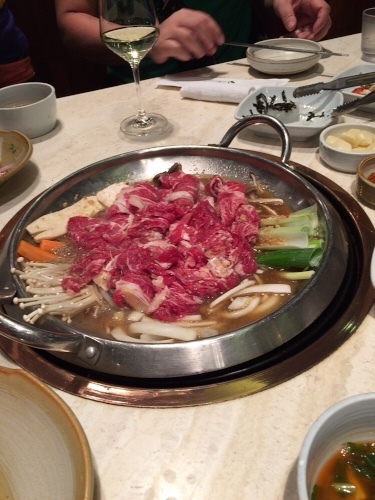 Lee Jung-Hoon, sommelier in Seoul, was quick to point out that Silvaner would be a good match with medium palate-weight Korean dishes. In fact, the Nordheimer Vegelein Silvaner Spätlese Feinherb 2014 with only 8.3 g/l residual sugar, courtesy from Peter, won a thumbs-up from a group of Hong Kong and China judges who paired it with fresh lobsters and crabs. In addition to the judging that lasted for four days, there were also seminars during the period with technical presentations on topics like viticulture and climate change, tasting sessions of less common wine such as those from China and Moldavia, as well as discussion on Asian markets trends and challenges. Jurors treasure these continue learning opportunities where they can share their insights with colleagues. 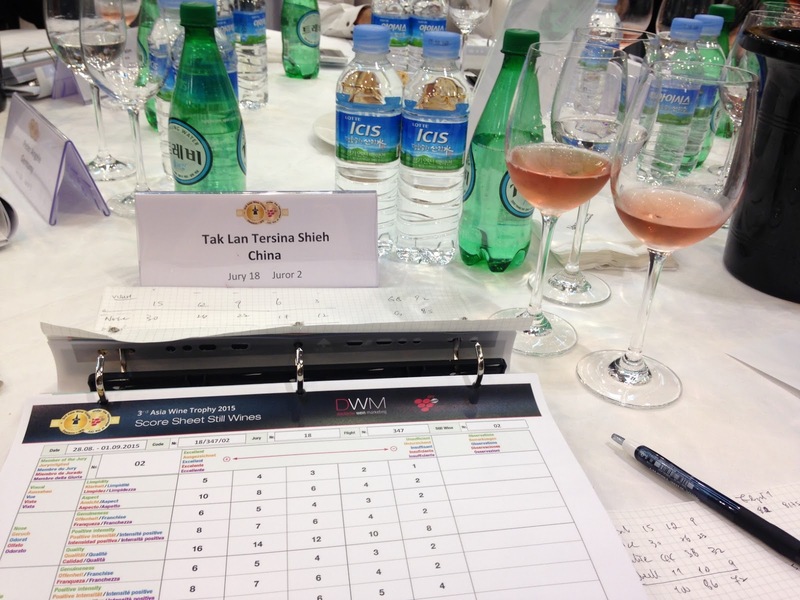 As one of the judges, one thing I learned is the commonalities and differences of various Asian wine markets. French wine may be the number one player in China, Hong Kong and Taiwan, its leading position is being threatened in Japan and Korea, and certainly not the case in Singapore and Malaysia. However, all countries show that Chilean wine is the rising star because of its quality/price ratio and it privilege of Free Trade Agreement with some countries. Although red wine still dominates in all markets, the consumption of white and sparkling are increasing with sparkling wine particularly popular in Japan and Korea. All agreed that the young generation and female consumers are the driving forces of Asian wine markets. However, the markets are still skewed to the premium end where buyers drink wine for the status and for gifting; and the lower end where wine is consumed as an alternative alcoholic beverage to beer. 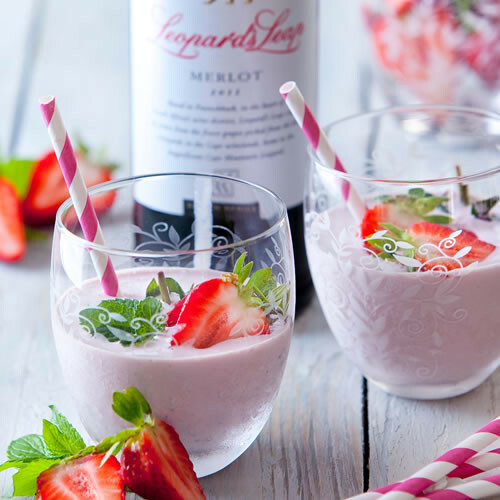 The majority of judges share the view that local food and wine pairing to introduce wine as part of lifestyle to Asian consumers is essential to develop the mid-market wine segment and to expand the consumer base. Stephen Hall, a New Zealand wine writer based in Malaysia, is an advocate and has been promoting Malaysian/Singaporean food and wine pairing for over 20 years. Flavour Colours, a Chinese food and wine pairing i-Phone/i-Pad app based on flavour intensity, developed in Hong Kong, is another fine example of promoting wine culture in Greater China. Judges also agree on the importance of social media platform, led by Facebook, to engage with the young consumers. Internet sales of wine, however, is allowed in some Asian markets such as Taiwan and Korea but nevertheless, it is an important communicate channel. For example in Korea, online reservation of wine for pay later at a pick up store is a clever way to circumstance the ban. Asia Wine Trophy and its parallel seminars demonstrated that although the Asian wine consumption is just at its beginning level (consumption per capita ranges from around 1.3 litre in China to 5 litres in Singapore), it is a long but exciting road for producers. Fellow wine judges, who are also wine ambassadors in their respective markets, should focus on how to sparkle the young consumers’ interests in wine by preaching the enjoyment of wine with local food. for average consumer. Park Chan-Jun, organiser of Asia Wine Trophy and a wine writer, echoed the view, and so did John Hung, Joe Sriwarin, TC Liong and Nelson Chow, presidents of Sommelier Association of Taiwan, Thailand, Singapore and Hong Kong respectively. 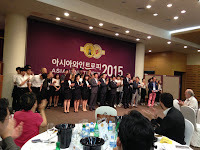 Next time you see an Asia Wine Trophy medal award wine, try it and see if you agree with the judges. 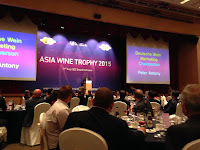 At the recent Asia Wine Trophy judging, I learnt that Chilean wine is the rising star in all Asian markets. 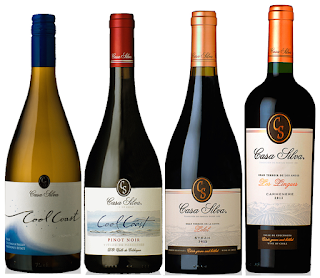 It was therefore no surprise that Mario Pablo Silva, CEO of Casa Silva, said that in China, Chile is the first wine importing country that cross consumers’ minds, and there is a whopping 65% of consumers who associate Chile with wine. I have to say that Chile has come a long way. Some ten years ago, the majority of Chilean wine in the market was entry level, value-for-money wine mainly from Maipo. 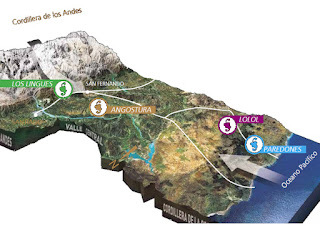 Now, wineries are pushing their mid and premium level wine - as Mario put it, they are promoting the new Chile where good quality wines made from different grape varieties that come from north to south and from coast to mountains. Indeed, Chile has checked all the boxes of capable of producing interesting and high quality wine. It is 4,200 km lengthwise with the Atacama desert, the driest place in the world in the north; and the Antartica, the coldest in the south. Its narrow width, average 177 km, is cooled by the Pacific Ocean breeze in the west and the Andes Mountain wind in the east. The country offers an array of climate and soil. It is up to winemakers to explore the options of matching different grapes with the terroir. Casa Silva is in its fifth generation. The family originated from St Emilion in France and settled in Colchagua Valley in Chile in 1892. It has several vineyards including the oldest one, Angostura, in Colchagua where the family has been planting since 1912; and Lago Ranco, in Patagonia where the family has their holiday home and only experimental wines are made. 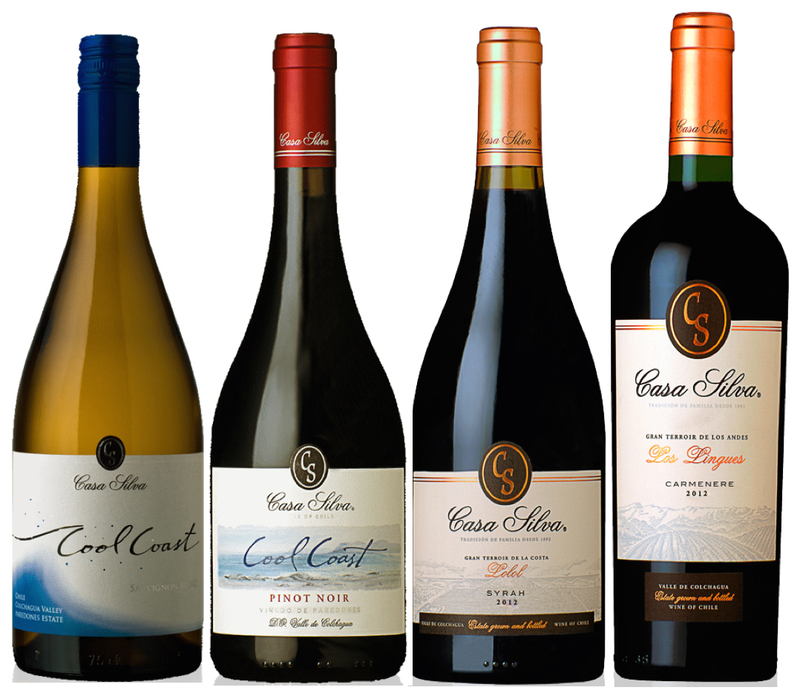 Casa Silva’s vision is to be recognised as a high quality fine wine producer; the leader, innovator of a new generation of Chilean premium wine; as well as an advocate of environmental sustainability - certainly ambitious but not impossible - as its wines do reflect the family commitment. I particularly like its Cool Coast Sauvignon Blanc and Pinot Noir, where grapes come from the Colchagua’s seacoast. Both wines are elegant with fresh fruits aromas and a mineral palate but save the pungency of typical New World wine, and at a steal of only $160/bottle. The Gran Terroir Syrah is also impressive. Although with 14.5% alcohol, it is well-balanced without the jammy palate and supported by black fruits and spices - another bargain at $135/bottle. from 100% Carmenere. The grapes come from the best selection from its Los Lingues vineyard at the foothills of the Andes. The wine is elegant with multi-layered aromas. We had a vertical tasting of four vintages fro 2006 to 2009 and my favourite is the 2007 - a perfect combination of black fruits, spices and perfume. Retailed at $440/bottle, it is certainly a much better-value wine than most. It is no wonder that Chilean wine is a rising star. Casa Silva is available from Sino Vantage. 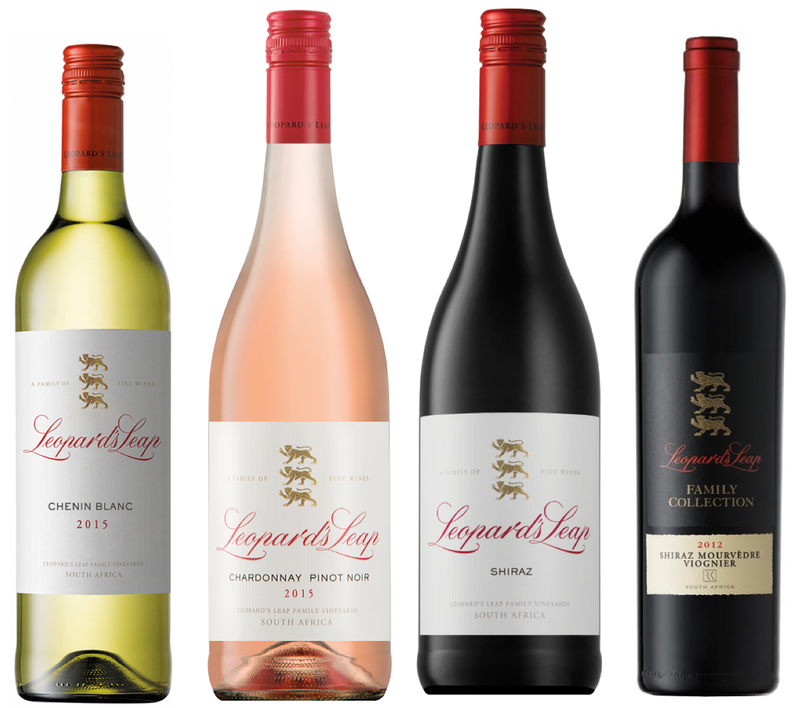 Leopard’s Leap Family Vineyards, located in Franschhoek and founded in 2000, is a mass-market brand probably dismissed by most wine connoisseurs. However, after talking to its owner Hein Koegelenberg, I believe it is a remarkable brand that connects average consumer to wine not via aspiration or status symbol, but genuine, affordable things that ordinarily people care and enjoy - food, conservation and literature. Hein’s definition of ‘passion for food’ is broader than just eating. Most wineries in South Africa has award-winning restaurants offering exquisite menus. At Leopard’s Leap, the family-oriented restaurant offers relaxed rotisserie-style lunches something similar to a Sunday roast or a dim sum lunch where family and friends can spend hours catching up. What’s more, there are also regular cooking classes where participants learn to cook recipes that they can easily prepare at home. But what impressed me most is its courageous wine cocktail recipe, including some classics with a twist such as Chenin Blanc Martini, and out-of-the-box surprise like Merlot Milkshake served in a whisky glass. I’m sure traditional wine lovers would be horrified but hey, we have to move on with consumers! If this is what makes the younger generation to try wine, so let’s go with the flow. Sooner or later they will gradually drink Chenin Blanc without martini and Merlot without ice cream, and we’ll have more converted wine consumers. The worldwide population of leopard has been decreasing due to threats to their habitats and hunting. Cape Mountain leopard refers to the smaller version of leopards inhabiting the mountains of the Cape Province in South Africa close to the Cape Winelands. 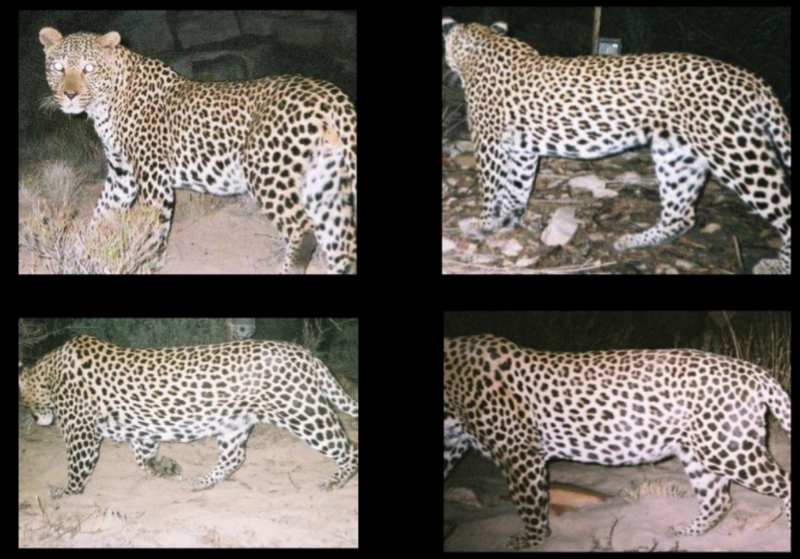 It is guesstimated that there are less than 1,000 Cape leopards in the wild. Leopard’s Leap is a sponsor of Cape Leopard Trust, an NGO aims to conserve the endangered Cape Mountain Leopard, by ‘adopting’ leopards roaming the Cape mountain ranges, and providing an interactive wall showcases at the premises as an educational tool for visitors to learn about wildlife conservation. A lot of wineries in South Africa are keen supporters of sustainability and Leopard’s Leap takes it one step further by being actively involved. Leopard’s Leap is also dedicated to nurture local authors and promote South African literature by creating platforms and sponsoring book launches and literary events. It is also a founding sponsor of the annual international Open Book Literary Festival held in Cape Town. In a country where education for the under-privileged is still an issue, this initiative touches a lot hearts. I definitely think Leopard’s Leap got the right marketing mix to engage to mid-market average consumer. However, this alone won’t make it a truly successful brand unless it has the quality to back it up. Leopard’s wine certainly doesn’t disappoint. It has a few tiers that appeal to different market segment, from the entry-level social enjoyment Lookout and the well-structured varietal wines Classic, to the specially crafted Family Collection and the exclusive Culinaria Collection - all well-positioned to encourage new consumers to trade up. Classic Chenin Blanc 2015: Refreshing with an elegant, subtle nose. Goes well with scallop. Classic Chardonnay Pinot Noir Rosé 2015: A new wine (first vintage); a well-balanced Rosé with red fruits and appealing mouthfeel. Classic Shiraz 2011: Elegant black fruits with a hint of pepper, fine tannin. Family Collection Shiraz Mourvedre Viognier 2009: A serious wine layered with fruits and spices with a smooth mouthfeel and lingering finish. 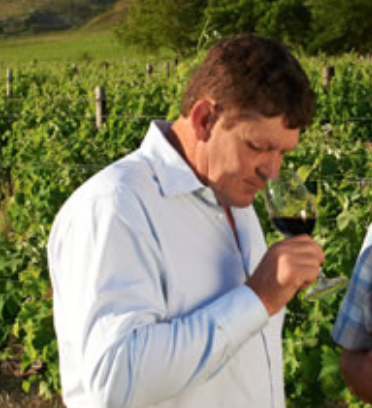 The big brother of Leopard’s Leap is La Motte, a Rupert family winery also run by Hein. According to Hein, La Motte is exclusive and aspiring while Leopard’s Leap is inclusive and friendly. Nevertheless, wines from both brothers are over delivered on quality. Both La Motte and Leopard’s Leap are available from Royal Oak.